Click here for a chance to make brunch cocktails with April on March 14th! Tired of the same old basic brunch cocktails? 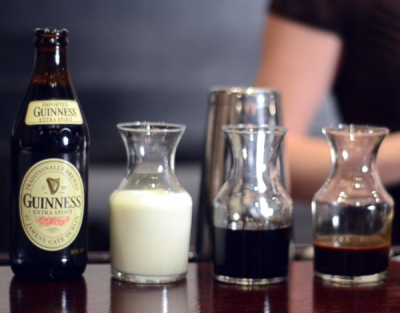 Check out the video above to hear about Astor Center instructor April Wachtel’s twist on an Irish coffee. Try the recipe below! Pour 2 oz Heavy Cream into a shaker tin. Remove spring from Hawthorne strainer and place in tin. Seal shaker tins, shake vigorously for 30 seconds. Build espresso and coffee liqueur in a tall glass. Pour guiness into glass with no head. Float whipped cream over the surface of the cocktail, grated cinnamon or nutmeg optional.